Flowers are present in various occasions of a person’s life. From corsages at a prom, roses on a first date, to a bridal bouquet at a wedding, flowers have always been there to complete an event. Even when a person is laid to his final resting place, flowers play a huge part in the ceremony. Chrysanthemums – White chrysanthemums are generally preferred because the white color symbolizes peace, truth, reverence and modesty. Carnations – Red carnations are often used as a base to prepare floral wreaths, and indicate passion and strength. White and pink varieties are also used in combination. Roses – Red roses symbolize love and passion, but they also indicate courage. Pink roses are more feminine and graceful, and serve to remind people of hope beyond their immediate sadness. White and yellow roses may also be used to indicate peace, innocence and love. 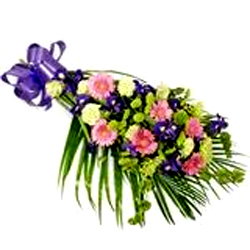 Lilies – To give prominence to funeral tributes, it’s best to use Oriental lilies that open completely. Symbolizing eternal life, lilies are often used in casket arrangements. Calla lilies give a peaceful appearance on lid sprays. Irises – The calming blue of the iris makes it one of the most graceful of flowers, implying hope and faithfulness.